Rogue River, OR (June 2013) – Wagner Meters is proud to continue to be part of the current moisture management QC program at Stimson Lumber in Plummer, Idaho. Stimson Lumber Company has a long history of forestry product production and forestry management. Their mills across Oregon and Idaho have a culture of sustainable forestry practices that look to maximize the use of the lumber resources they manage. As part of that process, the mill operation located in Plummer, ID, recently purchased the Wagner Meters Omega In-line Moisture Measurement System. Designed for the rugged demands of a lumber mill, Wagner’s Omega In-line Moisture Measurement System with kiln drying analysis software provides the ability for a mill to better track the drying performance of its kilns. Omega systems also provide this historical data by lumber product. The Omega system, and historically all Wagner planer mill moisture measurement systems, help mills reduce drying-related lumber degrade that can occur because of excessive “wet” lumber or over-drying. The Plummer mill runs a small log lumber production with a range of end products including dimensional lumber, fencing, decking and more in local wood species. With the Omega In-line Moisture Measurement System, they will be able to more effectively monitor and analyze moisture data in the production process in order to optimize their kiln-drying program and lessen degrade. Wagner wishes to thank Stimson Lumber’s Plummer mill for continuing to be a valued member of the Wagner Meters family of customers. 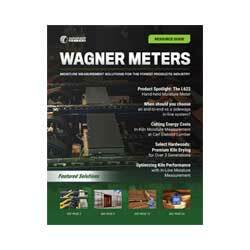 To learn more about Wagner Meters’ line of moisture measurement and management systems and instruments for the forest products industry, visit www.WagnerMeters.com.